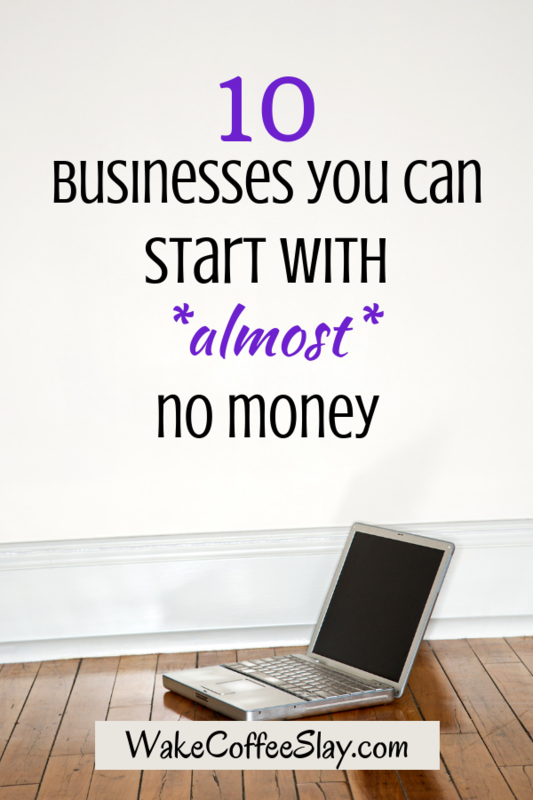 10 Businesses You Can Start For *Almost* No Money - Wake. Coffee. Slay. Do you feel caught between knowing you’re meant for so much more in this life, and also… errrrm…. knowing that the bills gotta get paid? If your life stage even remotely resembles mine, you’re currently juggling an endless whirlwind of student loans, mortgage or rent payments, a car note or two, maybe some credit card debt, the monthly household expenses, kids (cha-ching! ), all of the above, or any combination of these. *Sigh* Sure, it’s fun to daydream about creating a business. One that actually allows you to follow your passions and achieve time and financial freedom. But then you snap back to “reality” and the overwhelm of bills and financial commitments firmly puts an end to your entrepreneurial hopes before you even start. WAIT! This doesn’t have to be the case! Let’s face it: The only thing worse than knowing you’re here to do something great is feeling like you don’t have the extra cash to push those dreams forward. And yes, there are few things in life that are actually free. But, there are certainly a number of side hustles that can be started leanly and with very little startup money. 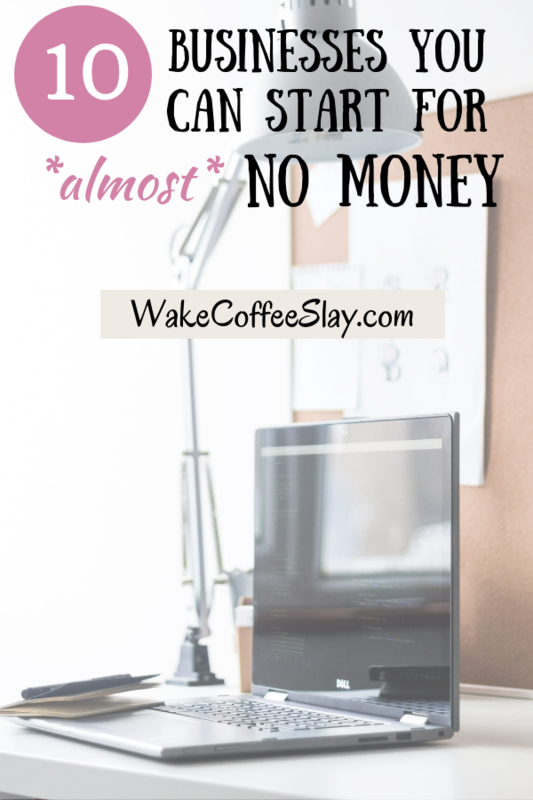 Here are 10 business that you can start for *almost* no money that will put you on the path to living the life of your dreams. 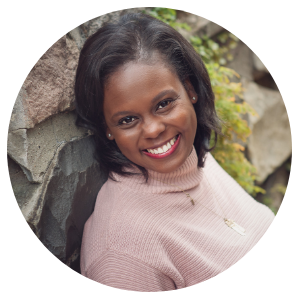 Sitting in-between a life coach and fitness coach, a wellness coach works with clients to develop and achieve their overall health and well-being goals. This is an emerging type of coaching as more and more people are starting to challenge themselves to substitute in healthier habits and behaviors to help sustain a better quality of life. Wellness coaches can have a range of specialties, from general health and wellness coaching to specific niches like diet and nutrition, stress management, or other healthy lifestyle and mindset adjustments. If perusing the aisles of Home Goods for that perfect piece in your home is your jam, considering starting a home staging business. Home stagers work hand-in-hand with realtors by decorating a home in a way that will make it easy to sell. You’ll need to know how to make homes feel bigger, brighter, and make potential buyers feel like they’re “home.” This could also be a great side business if you’re a real estate agent who’s feeling a bit unfulfilled by the career. Combining your knowledge for the real estate market with that designer’s flair could give you a unique perspective and make you a powerful force within the industry. Starting a blog has become a hot hot hot way to make a few dollars on the side, and some bloggers even made enough money to replace their full-time income. Bloggers come from all walks of life and blog about everything you can imagine. Some write interesting musings about their daily lives (often called a lifestyle blog). Some bloggers disseminate information about a specific topic and teach people how to do something or achieve a milestone. 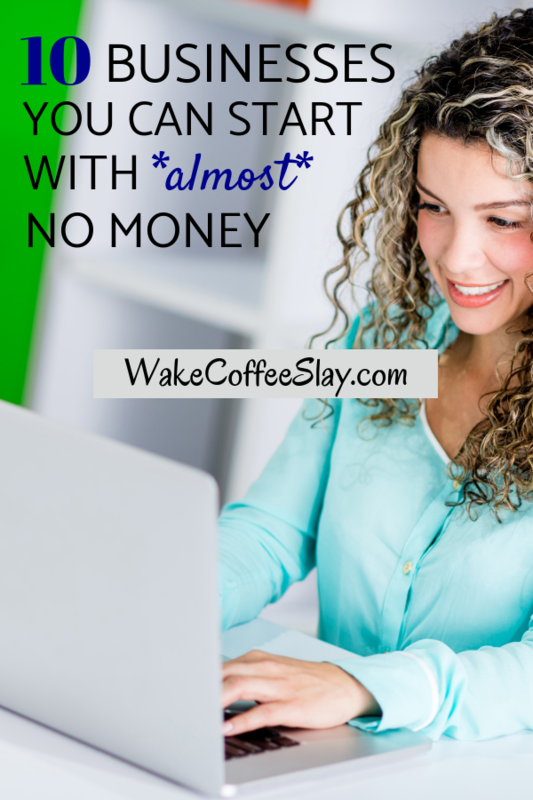 There aren’t many hard and fast rules for making money by blogging. You do, however, need to write interesting enough content that draws traffic to your site and keeps them coming back for more! If you have any experience teaching students in a classroom setting or expertise in a particular subject, then a tutoring business could be the perfect side job for you. Tutors work with students outside of dedicated school hours to help them improve academically in areas and for subjects with which they may be struggling. Whatever subject you’re tutoring, it’s super-important to know that subject inside and out. One of your main responsibilities will be to come up with alternative ways to teach something for a student who didn’t “get it” when it was taught in a more conventional way. You’ll also need to have an intuition to be able to assess on the fly whether your student actually did “get it” and they’re not just faking it. If your friends have named you the social director of the group, you might thrive as a corporate event planner. You’ll need to plan outings when companies have all-hands meetings, trips, conventions, product launches, or the like. Being solutions-oriented is key, as you would be responsible for coordinating all of the moving pieces of their event. This will often include food/catering, hotel rooms, invitations, meeting spaces, entertainment or speakers, transportation. You probably already know that professional organizers create systems and processes that reduce clutter and make homes function more efficiently. However, to really stand out, you’ll have to do more than arrange your client’s spices in alphabetical order. There are hugely psychological aspects to understanding why people’s lives get out of whack with clutter in the first place. Is the chaos a result of deep-seated emotional, anxiety, or social issues? If you are a born organizer who is also a calming and trustworthy presence, there could be a great opportunity for you with a Professional Organization business. Organized? Check. Forward-thinking? Check. Great with people? Check. If you have these characteristics, then you may seriously want to consider opening a virtual assistant business. Virtual Assistants (VAs) help keep their clients’ professional and personal lives in check. You might be responsible for emailing, scheduling appointments, researching and purchasing gifts for upcoming birthdays or anniversaries, arranging travel for your clients, updating their company’s social media, or truly almost any other day-to-day task you can think of. 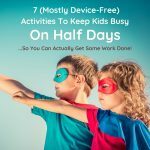 But as long as you have access to a computer, you can do a majority of these tasks from anywhere in the world! How cool is that? Keeping spaces clean is not everyone’s strong suit. So outsourcing that chore is something appeals to many residential and commercial clients. If you have a knack for seeking out dust bunnies that like to hide in corners and on baseboards, starting a home cleaning business could be the right move for you. And bonus points will come your way if you can build your clientele on a referral basis. This is because skill and TRUST are two critical components of running a successful housekeeping business. 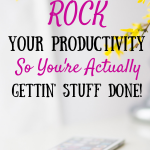 If you can appreciate the writing process, but don’t necessarily want to be the one who creates the content, starting a proofreading side hustle may be for you. With the increase in content that’s being created, especially web content, proofreaders are more in-demand now than ever. Proofreaders (which are different from editors) check for spelling, grammar, and punctuation errors after a piece of content is already finished. To be successful, you would need a strong command of the language and its grammatical nuances. Social media managers are responsible for creating content, monitoring and responding to feedback and messages, and creating advertising campaigns. To be successful, you need to have a deep understanding of the social media landscape AND a deep understanding of and empathy for your client’s customers. (So much of life is understanding and having empathy for others, amiright??). This is another business you could start from the comfort of your computer. Just take your laptop with you if you relocate or travel, and you’ll be all set! Thank you, Sir Branson, for reminding us that you don’t have to start off big to end up big. So yes, you CAN start a side hustle with a sparse savings account. The key is to start “lean” in the beginning and take things step-by-step as you grow. That way, you can pocket a portion of the profits and reinvest the rest to grow your business. I’d love to hear your thoughts! Have you ever considered a side hustle? What other questions do you have about starting a side hustle? Share your thoughts in the comments. And as always, if you feel like this is information someone could use, please share this post! Sharing is caring! Cheers to the journey, you side-hustler, you!